Order Your Bermuda Shutters Today! Bermuda shutters add distinctive touches to your home or condominium. Unlike most commercial outdoor shutters, this style is top-hinged. Bermuda shutters swing up and away from the home to open, and can be closed easily, too. The Bermuda (or, Bahama) shutter style dates back to the epoch of British Colonialism when the British set up plantation outposts in Bermuda. Today, Bermuda shutters are installed on a wide variety of homes, and can complement many architectural styles. The chief advantages of the Bermuda shutter style are protection from weather and climate control. Because they can be opened and closed so quickly, they are good choices for homes in storm-prone climates. They can be shut in advance of a storm to protect your home's windows. 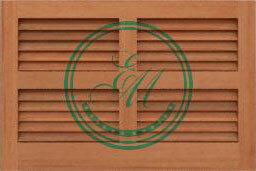 Our Bermuda shutters feature vents, or louvers, in the shutter body. These slim wooden slats encourage air circulation - a treat on a stifling summer day. You can prop your Bermuda shutters at various angles, as well, to control airflow into your home. Estate Millwork shutters are crafted from solid hardwoods. There is not a single ounce of particleboard or plastic in these pieces. We offer four distinctive styles of Bermuda shutters, each evoking a distinct sense of place. The Saint George - This classic style consists of two long columns of solid wood louvers set inside pure wood frames. The Saint George is a very versatile shutter style and offers excellent ventilation to your home interiors. The Island Breeze - This shutter style is similar to the Saint George style, but the louver slats are thinner. This style gracefully complements modern architecture, but is a treat to see on Victorian-era houses, as well. The Governor - This style is similar to the Island Breeze, but with one difference: the addition of a center cross panel, which adds a solid, mature touch. The Governor goes well with various styles of period architecture -- Colonial and early American styles, for example, look great with Governor Bermuda shutters. The Kingston - The Kingston style offers a very unique look. It consists of three extremely narrow columns of wooden louvers, set inside thick, pure wood frames. Like The Governor, this style is accented by a sturdy wood crossbar at the center of each shutter. Frank Lloyd Wright or Walter Gropius-style architecture looks beautiful with Kingston-style shutters. Each shutter style can be ordered with fixed or operable louvers. Customize your shutters further with mouldings, shutter horns, or custom stiles and rails. Our company is proud to offer top-quality craftsmanship in each pair of Bermuda shutters we create. We start with genuine, top-grade hardwoods. Then, we assemble our pieces with mortise-and-tenon joinery. This time-tested method of furniture assembly dates back to ancient China, and over centuries, has been thoroughly vetted as the only high-quality way to make shutters. Chances are good our competition is using nails or glue to assemble their shutters. Here's another way Estate Millwork stands out from the competition: We go green. In recognition of limited natural resources, we only work with timber supply companies who practice sustainable harvesting techniques. We also closely monitor plant temperatures, and actually recycle wood scraps for fuel or for other projects. The other perk of us "going green?" Less waste means a better value for you. Estate Millwork Bermuda shutters: First in class. 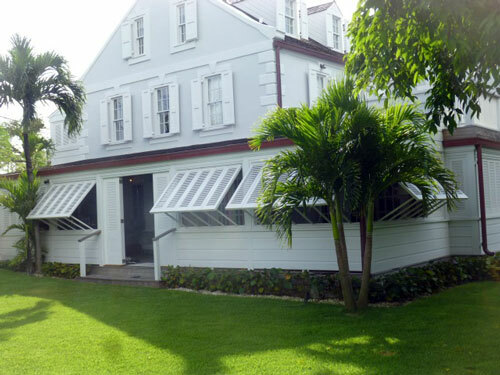 To order your Bermuda shutters, call or e-mail our customer service team today.